It is pancake day again at my house (big surprise, right?) Since pancakes are such a big hit with the little guy, I am constantly experimenting with fun (and healthy) variations on the simple pancake. This time, I decided to add in some yummy orange vegetables and some cinnamon to make a pancake reminiscent of a super indulgent carrot cake. 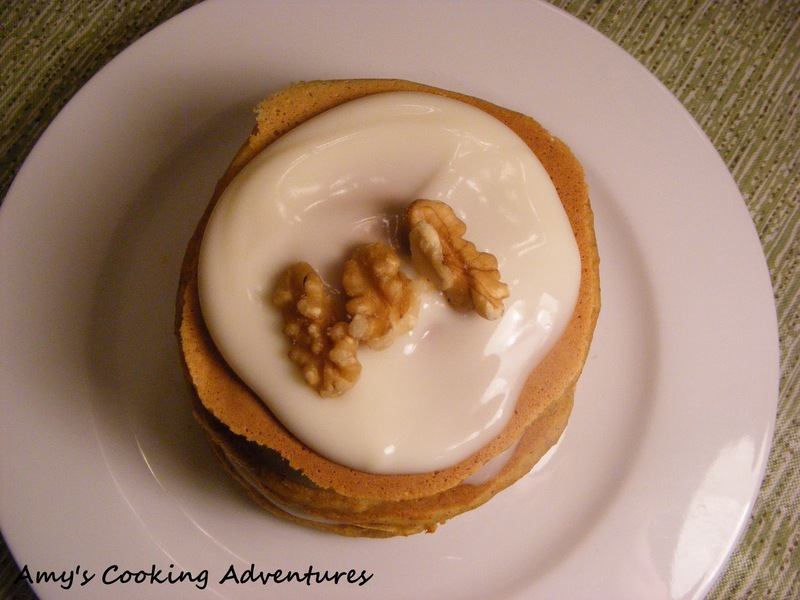 Since I thought adding cream cheese frosting to the pancakes would defeat the purpose of making pancakes instead of just going for the cake, I used French Vanilla yogurt and a sprinkling of walnuts in place of frosting or syrup. Of course some pancake fans, like my dad and little guy choose to forgo the yogurt since they are unwilling to part with their syrup. Others like my husband and mom loved the yogurt! In a separate bowl, whisk together eggs, milk, pureed carrots, honey, and vanilla extract until well blended. Pour liquid ingredients over the dry ingredients and stir until just combined. These look tasty! Way to go! OMG REALLY?! This is awesome!!! I LOVE carrot cake. Any sweet thing with carrots and cinnamon. I am a fan! Oh! My little girl would LOVE this! 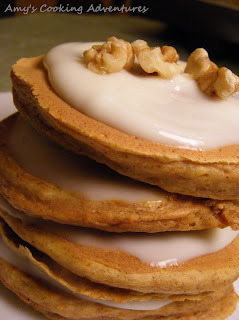 For her birthday, she really wanted a carrot applesauce cake (which she got), but carrot pancakes - yumm! Wow - you're a genius! Very, very sneaky way to get your little one to eat his recommended serve of 5 veggies a day when you sneak a veggie into breakfast! Love the idea of carrots in pancakes- also love all the other healthy things you added to them. I will have to try this one with my kids. Sweet potato puree or pumpkin would also be good in these (and a healthy item to sneak in for the kids). Amy, what a great idea. I lovve these pancakes! I love this recipe, it sounds delicious! Definite bookmark! Your pancakes look awesome! 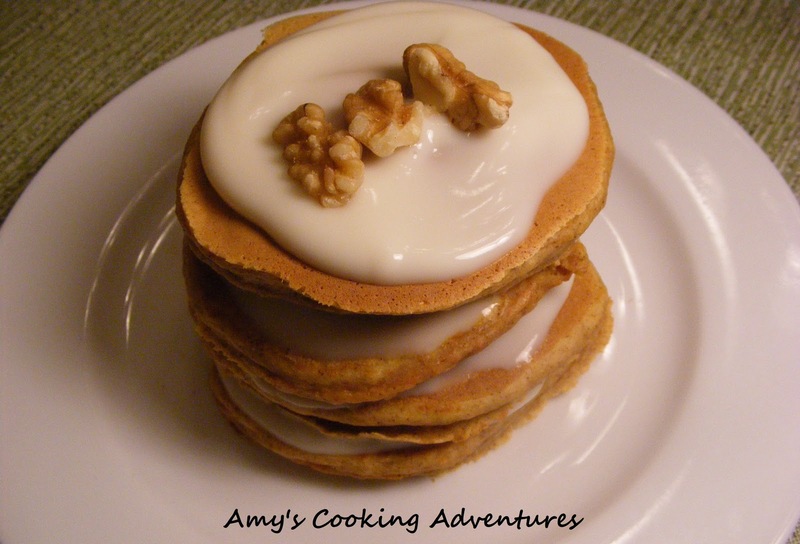 Love the idea to use yogurt instead of syrup! I think it's obvious that I like CARROTS and I look forward to my mom's annual birthday carrot cake....so THIS just plain old makes me HAPPY! I have to share this recipe with others! I was hoping that white glaze was icing, but now that wouldn't be very dietitiany now would it? LOL.